We decide to continue the loop. 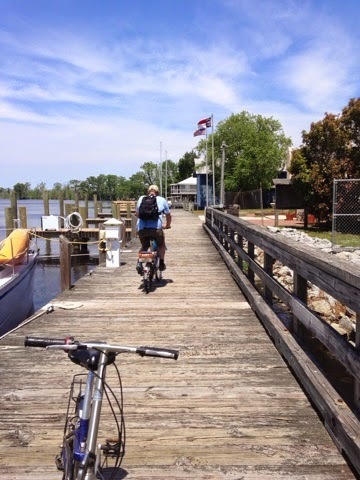 We pick Columbia as our next stop because favorable winds will allow us to sail across the Albemarle Sound for the 15 mile hop. It's a tricky exit from our slip at the Plantation. The wind is blowing us onto the dock and we have a piling to clear. The Captain sets up the lines, and then First Mate (who has to pull in those lines) asks a few questions. However, the departure is uneventful, with the help of a boat hook to fend off the pilings. Nice. The Captain remains at the helm and the First Mate was running the sails as we head across the Sound. However, after putting up the main and genoa, it's a broad reach all the way across with no tacking required. We have 10-15 kts of wind and average 7 kts under sail! 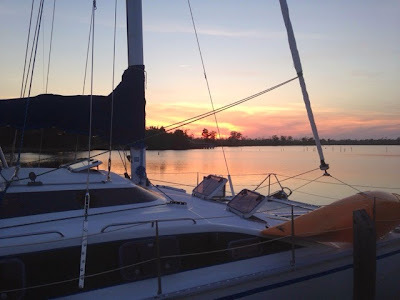 After furling the sails to the enter the Scuppernong River channel, the starboard engine (yep, Lokie) refuses to start. After starting Thor and doing a few circles, the Captain gets it running (starter solenoid going bad?) and the First Mate heads up on deck to prep lines and fenders for arrival. The Cap anticipates a port side arrival (which means it will be starboard), when the new fender goes overboard--the Captain tied that knot! We'd been meaning to practice man-overboard drills and there it is. We called ahead to Columbia to let them know we were coming. 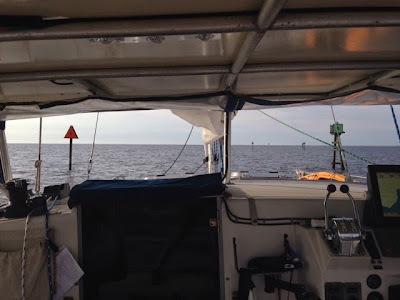 Upon arrival and a slow reconnaissance pass, we find the wind is blowing us off the dock, but I got a line around a cleat before the stern swung out. The crew is getting braver, so the Captain pulls the boat up to the dock with the bow line and the First Mate jumps off, grabs a stern line and pulls the stern onto the dock. Every docking is different! The end result is a very sheltered dock with free power, water, bathrooms and showers. When we step off, we are at the end of Main Street. Someone immediately stops by to say hello and directs us to Sandy's for lunch (free wifi). The boss went back down the dock for an action shot. The grocery store is 0.8 miles away, so we unload the folding bikes and backpacks and head off--(we're out of olive oil, Luzianne tea bags & diet coke. Not a crisis. Worth the trip). As moderately serious road bikers, we feel a little silly on the child-size folding bicycles ("I bet I look like a circus bear") but it makes the 0.8 in 76F weather a quick errand. "I can strap a 12-pack of Yuengling to the rack on the back. I'm not kidding." 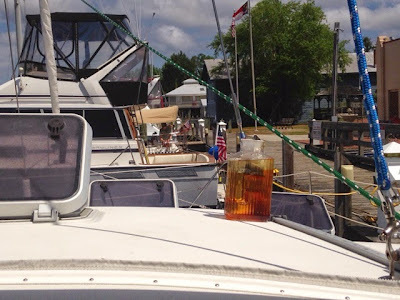 We celebrate with sundowners & kindles in the cockpit and enjoy the breeze. Dinner is homemade coleslaw, iced tea (yep, this is perfect for the boat. Don't know why it took that long. And I have simple syrup I use in coffee!) and grilled. We take an evening dinghy ride under the bridge and farther up the river. Day 2 Columbia: The Captain pumped up dinghy and does a water line scrub. "Being Captain is basically like being head janitor." I do another grocery run on the bicycle. We walk down to coffee shop in the winery, then on to the boardwalk where I get attacked by horse flies (Husband hits me on the back. "That wasn't a fly. I just smacked you.") I'm out--see you back at the boat! Lunch is a gluten-free frozen pizza (a special treat when you have to buy it, get it home while it's still frozen & cook it in our bent pizza pan because the oven is only 10" wide!) 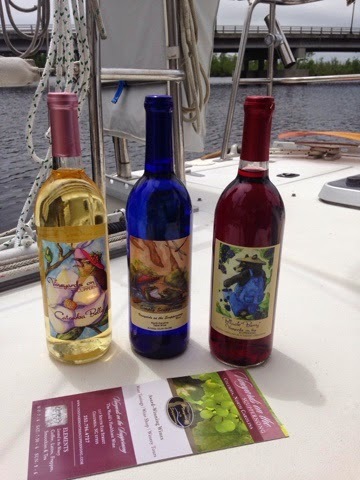 Afternoon naps are followed by a wine tasting at the winery (The Captain purchased 3 bottles of wine--budget out the window! These free docks are killing us.) I go out for a kayak while Captain rides his bike. The Captain and Amelia the cat take another nap before our evening out. It turns out the Oyster Bar is out of oysters and we're back at the boat before the music starts (dinner was still very good with excellent service). Nice try, honey. Our attempt to get off the beaten path had landed us in another party. The pontoon boat that gives free rides shows up along with 3 trawlers and a sailboat that are here for an 80-person Cypress Cruising Club Reunion. Docked off the end of Main Street. Yes, we're aware of Tropical Depression Ana off the coast. 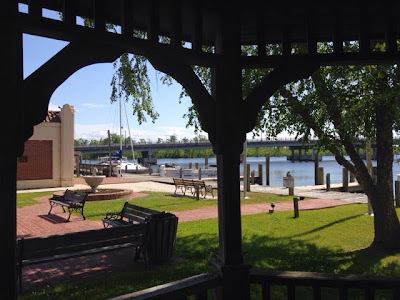 We are off the ICW, up the Albermarle Sound, and up the Scuppernong River in a relatively sheltered dock. We'll wait and see. 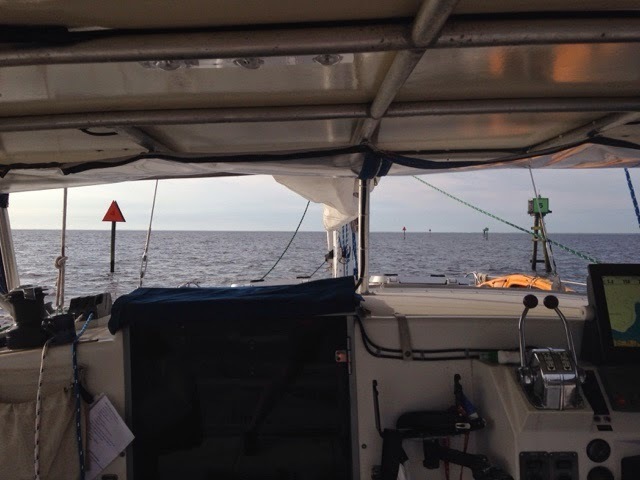 We've anchored out in 25 kts+. The forecast is for 17 kts where we're at. Get a pizza stone for the bottom of your oven then put your pizza on a piece of parchment paper and put it directly on the stone. Perfect pizza every time. Leave the stone in the oven all the time. It helps hold the heat so you lose less propane. Thanks, Deb. Oven has been working pretty well, but I need to do this!